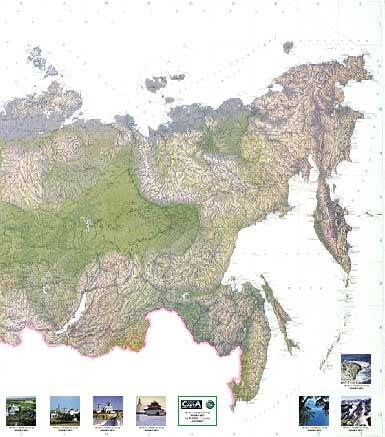 The new folded map of Russia and Neighboring Countries is the first edition of its kind containing more than 8,000 geographic names in the Latin alphabet. It covers the entire territory of the former USSR and includes several photographs of famous attractions. Its design is based on our previously released award winning Wall Map of Russia in Cyrillic. The current folded version is easier to read since all the names are transliterated. During compilation of the map the goal was to present not only the accurate information by making the map as detailed and complete as possible for a given scale, but to depict relief, natural zones, settlements, highways, railways and political-administrative borders. 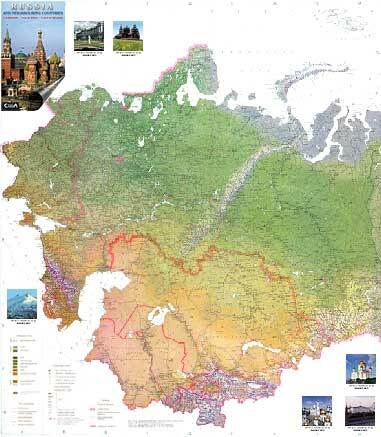 This is the most accurate up-to-date map of Russia currently available. Russia (The Russian Federation) - located in the eastern part of Europe and in the northern part of Asia. Russian territory is surrounded by the Baltic Sea, the Black Sea, the Sea of Azov, the Arctic Ocean and the North Pacific Ocean. Population - 147,100,000. More than 4/5 of the population is concentrated in the European part of Russia. Capital - Moscow. Currency - ruble. Language - Russian. Religion - Russian Orthodox, Muslim and other. Russia is the most multinational country in the world - comprised of more than 90 national groups. Its constitution was adopted on December 12, 1993. Russia's Chief of State - President - is elected to a four-year term. The Prime Minister appoints the government to administer the executive branch functions. The legal system is based on a system of civil law. The Legislative Branch - is a bicameral which convenes for a Federal Assembly. Russian Federation's administrative division consists of 89 territorial units which have equal rights. Russia is the largest country in the world in area size (17,075,200 sq. km. ), covering 11 time zones. The Northern most continental point is Cape Chelyuskin (Taimyr Peninsula); the Southern most point is Mt. Bazardyuzyu (Dagestan); the Western most point is sand spit near Kaliningrad city; the Eastern most point is Cape Dezhnev (Chukotka Peninsula). There are more than 120,000 rivers and 2,000,000 lakes in Russia. Lake Baikal is the deepest in the world (more than 1570 m). The largest river is Yenisey (Siberia), the most famous river is Volga. Russia's climate ranges from the Steppes in the South to the Sub Arctic in Siberia to the Tundra in the Polar North. Winters vary from cool along the Black Sea coast to very frigid in Siberia. Summers vary from warm in the Steppes to cool along the Arctic coast. Precipitation is low to moderate in most areas; highest in the northwest - North Caucasus, Southern and Eastern Siberia and Pacific coast. The cities of Russia are presented with their history and evolution. Moscow recently celebrated its 850th anniversary. Many historical and architectural monuments have been reconstructed. Moscow is the largest cultural, transportation, economic and financial center of the country. St. Petersburg, founded by Peter the Great in 1706, is the second largest city. Since that time to 1917 it was the residence of Emperors and the capital of the Russian Empire. There are many beautiful palaces of significant architectural value. The "Golden Ring" of Russian ancient cities makes for a fascinating trip. They are Sergiyev Posad, Suzdal', Vladimir, Pereslavl', Rostov the Great, Yaroslavl', Uglich and other. The largest cities of Urals, Siberia and Far East are Ekaterinburg, Omsk, Novosibirsk, Krasnoyarsk, and Vladivostok. The Russians or "rossiyane", as they are called now, are well known for their hospitality, openness and daring. No significant event is ever celebrated without the abundance of Russian traditional delicious food and drink. The most famous Russian drink is vodka - an indispensable attribute of any table - and the Russians have a unique skill in drinking and enjoying it. The stores lately are full of goods from all over the world and the level of the service finally come up to the European standards. Deluxe edition, 1999/2000. Scale 1:5,000,000, dimensions 40" x 36", double-sided. Printed in the USA on 80 lb. premium gloss paper with protective aqueous coating. Price for a single copy, including separate brochure "Index of Geographic Names", is only $29.00. Quantity discount available. Quantity is limited, so order your map now!